On December 5, 1902, the Hall of History—predecessor of the North Carolina Museum of History—opened in a small room inside the old Agriculture Building in downtown Raleigh. “Curiosities” collected from across the state by former newspaperman Frederick Augustus Olds and historical artifacts from the State Museum (now the North Carolina Museum of Natural Sciences) filled the Hall’s walls and exhibit cases, constituting the core of its collection. Olds became the fledgling museum’s first director. During his 32-year tenure, he visited all of the state’s 100 counties, amassing nearly 30,000 historically significant objects and the stories connected with them. 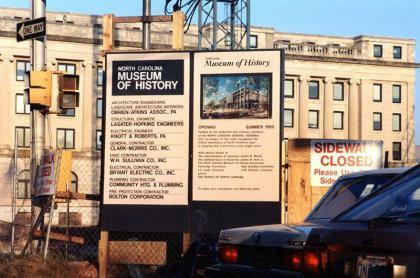 In 1965, after moves to two other locations, the Hall of History was renamed the North Carolina Museum of History. Three years after that, it moved into a new building on East Jones Street, sharing space with what is now the North Carolina Office of Archives and History and the State Library. The museum finally received a home of its own in 1994, when its current building opened on East Edenton Street. Today, the four-story facility has nearly 75 people on its staff, 150,000 objects in its collection and is the flagship of six other museums in the state history museums division.